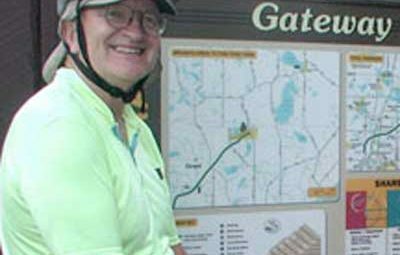 One of the state’s most heavily used trails, the Gateway State Trail, likely would not exist were it not for the work of former Parks & Trails Council Board Member Peter Seed. Tonight we are pleased to honor Seed with the Parks & Trails Council of Minnesota’s highest honor, the prestigious Reuel Harmon Award. Seed served on the Parks & Trails Council board from 1985 to 2006 and remains an active, honorary director. What stands out is his work, beginning in 1980, to convert the abandoned Soo Line track to a trail. Citizen groups and local governments wanted the Minnesota Department of Natural Resources to acquire the land, but a group of landowners adjacent to the line were trying to buy it, too. The Minnesota Parks Foundation, the predecessor to Parks & Trails Council, provided the state with enough money to win the bidding war. When the landowners sued, claiming that the law required the land to revert back to adjacent landowners when the railroads stop using the easement, Seed, a lawyer with Briggs and Morgan, went to work. Seed said it was longtime Parks & Trails Council President Samuel Morgan who took the lead on the case for the Minnesota Parks Foundation. “I was Sam Morgan’s go-to research guy and I helped develop the theory,” Seed explained. Morgan submitted the theory through a friend of the court brief for the Minnesota Parks Foundation and the Minnesota Supreme Court agreed with the theory they developed. That theory was that the land does not go back to the property owners as long as it continues to be used for public purpose such as a recreational trail. The case and the brief have been cited numerous times nationwide. Seed takes even more pride in a case from 2004 that affected the Paul Bunyan Trail. Again, landowners wanted railroad property to go back to them and the lower courts had agreed, saying the railroad had abandoned the easement. Seed took a close look at the old railroad and land documents and concluded that the railroad had a fee title, not an easement, so adjacent landowners would not have a claim. The Minnesota Supreme Court agreed and the Paul Bunyan Trail is now the longest and one of the most popular in the state. “It was my homerun,” he said, while crediting Robin Wolpert with arguing the case. Seed has co-authored two books, Biking with the Wind, about bicycling in Minnesota and A Coastal Affair: Walking England’s South West Coastal Path. Seed helped found the Gateway Trail Association and continues to sit on its board. He travels the world with his wife Linda and hikes and bikes on trails. They have two adult children, Nancy Barkas and Jonathan Seed.